Mrs.Un perfect did just that this morning, she busted into tears when Paul said I need more white socks. Hot issue for 6:30 am in the morning and tears of course normally will follow such a harsh statement. It was surely his tone of voice or maybe it was sarcasm or maybe he was screaming and pointing at me shouting “WOMAN ME NEED SOCKS”. I wrestle with the need to be perfect and to meet the needs of others before they need them, after all I am home all day 99.9 % of the time and there is only two of us in our home. I never leave the house most days at all, I take care of my to-do list and if I leave to go out of town to a writers conference I prepare all the clothes so he does not even have to start the washer. Then here it was No Socks on a Tuesday morning! The tears came faster than you can imagine, not the lil tears rolling down your face kinda tears it was the noisy kinda crying, like when someone really hurts you or someone passes away that you love kinda crying. This actually came after I said you have socks they are just not in your drawer they are unfolded in the basket😥. He’s smiling because he’s holding brown socks he wears with his brown shoes and would work just fine. No I throw my self into a crying fit because you can’t wear those with work boots! He just let’s me cry because I think he understands that I am my own worse enemy, and in my head the fact I failed to do what I consider to be a important job actually has nothing to do with the socks. It has everything to do with my need to be perfect and the fact that not only the scars from my life that have not healed fully but the constant attacks that come daily because I fall short according to my own expectations of myself. It’s not the expectations of others that let me down it’s the ones I set for myself. Coming from a life of domestic violence and emotional abuse where every flaw or need that was not met by another and was shouted loudly or the payment was ignoring you because you failed or you did not meet those often unknown expectations it leaves you with a drive inside to do things ahead of time before the words or the anger comes. The things I learn to do in order to protect myself from the retaliation of a angry person. Old habits and thought patterns that I learned the first 42 years of my life. Paul never raises a voice or gets upset with me, he really loves this un perfect girl. What a relief because she’s her own worst enemy sometimes. Paul said it best to me this week on our 5 Mile walk in the forest .. ” It must be exhausting to wrestle with yourself so much”. I replied with just tears in my eyes Yes it is! He’s a pretty smart man who loves his imperfect wife, and today he’s wearing his white work socks and I feel good about that !!!! Letting go of old patterns and old ways of living is often hard to do, but we should always be moving forward and growing in our lives and not remain stuck in the past😥 ways from our previous marriages, relationships or childhood. What do you need to let go of today in order to move forward? What can you embrace and love about you today? For me it is the socks were not folded in the drawer but they were clean in the basket! 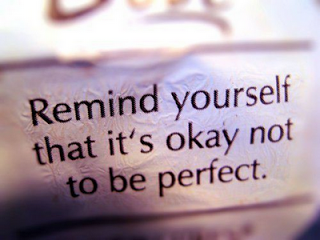 For me it’s ok not to be perfect !!! !